Daughter of Heinrich Hoffman, Hitler's personal photographer. She was nine when she met Hitler for the first time. When she was twelve Hitler took her to the Bayreuth festival. She was nineteen years old when she married Baldur von Schirach, the future leader of the Hitler Jugend, in 1932. During the same year she joined the NSDAP. Between 1933 and 1942 she and Von Schirach had four children. In 1943 at the Berghof she pleaded with Hitler for a more humane treatment of the Jews in Amsterdam. Hitler was furious and broke off all relations with her. Goebbels noted is his diary that the Schirachs had only noted their feelings after 60,000 Jews had been deported from their own front door. When the war was over she was imprisoned for a while at Rum near Innsbruck. In 1949 she asked for a divorce from Von Schirach, who served a sentence of twenty years in prison. At that time she had a relationship with Peter Jacob, Leni Riefenstahl's former husband. On 20 Jul 1950 she was formally divorced. In 1956 she travelled to London to ask the British Foreign Minister Selwyn Lloyd for the release of Von Schirach, but he wasn't released until he had finished his sentence in 1966. In 1982 her book of anecdotes "Frauen um Hitler: Nach Materialien" was published by the right extremist publisher Türmer Verlag. In it she described Hitler as a cozy Austrian who meant well. 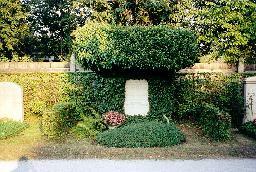 The grave of Heinrich Hoffman at the Nordfriedhof, Munich.